Our Dropshipping Multipurpose Responsive Shopify Theme give merchants greater flexibility when they customizing their online store. Within each section, you or your client can easily add, reorder and remove chunks of content such as products, slideshows, videos or collections. You can preview your changes in real-time in either desktop or mobile view. With our Dropshipping Multipurpose Responsive Shopify Theme, you can showcase your design skills and help merchants bring their. Our Dropshipping theme is responsive drag and drop sections shopify theme. This theme is very suitable. All section are easily moved by drag and drop. It helps for makes easy to build your own pages without coding skills. It allow you to fully customize every shopify pages. Using this theme you can make every page your own by dropping new elements. Text, images, buttons and even widgets such as countdown timers all snap into place with ease. Using our theme, you can see your pages automatically look great on every device, so you can reach more potential customers from mobile, tablet or desktop. Dropshipping theme feature has Add Customizable theme sections, Super Responsive Design, Google Web Fonts Integration, Advanced Group Filtering, Ajax Shopping Card With Nice Success Message, Notify Product With Carousel Slider, Multi Currency System, Compatible With All Major Modern Browsers, Simple & Powerful Theme Setting Option, Full Width Slider, Based On Paira Shopify Framework, Google’s Rich Product Snippets, Super SEO Optimized and More. Dropshipping is the best-reviewed Shopify theme ever. Dropshipping is designed with large Responsive Web Design (RWD), therefore the website can be display perfectly in all devices, such as: desktop, iPhone, iPad, Smartphone Android, Tablet Android. Dropshipping is a multipurpose responsive fashion theme with sections. Easy to customize features. This theme is flexible, user-friendly and really easy to configure. Dropshipping theme makes your online eCommerce store look awesome without slowing the load time. This theme support is fast and very helpful. 3) After Extract/UnZip you can see a file name dropshipping-shopify-theme-v1.0.zip and another folder called documentation. 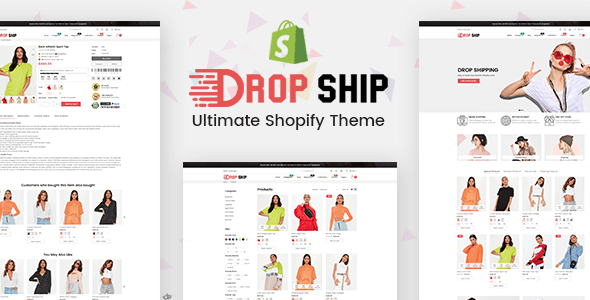 This dropshipping-shopify-theme-v1.0.zip is install file. And this documentation folder have full theme documentation.